Zachary was born in 1997, the youngest of the family. He was welcomed by his brother, Beau, and sister, Devyn. He was a happy baby. Zach started a lifelong love of the game of football when he was 5. He began by playing flag football. At that age, it was more about learning and just having fun. During the 4th grade, he would meet his best friend, Favon. They began playing football together and were very close. Several years later, Zach and Favon legally became brothers. They would continue to play football as teammates through their junior year in high school. Zachary’s personality was very easy going. His smile was ever-present. Those he was close to knew that a visit usually meant a hug. He was always a “husky” kid and took some ribbing about it. But he never really let it affect him. In time, he would grow into a strong man, yet he kept the spirit of the child. On December 18, 2013, Zach received devastating news. He was diagnosed with osteosarcoma, a rare, but aggressive, form of bone cancer. He would undergo several biopsies, countless chemotherapy treatments, limb salvage surgery, three invasive lung surgeries, and amputation of his left arm. At the time of his diagnosis, Zach was 5’10” tall and weighed just over 200 pounds. He was a stand-out defensive lineman on his high school football team (hence the name of his Facebook page and this site). His treatments were administered at Phoenix Children’s Hospital. While the hospital does rank very high nationally, it was designed for a child. Zach was literally a giant when it came to using exam tables and MRI machines. During his many stays at the hospital, Zachary easily made friends with the nurses. His attitude and easy smile helped in that way. Also, since he was older, he was a bit of a change from most of the other patients. While he enjoyed the Disney movies shown on the in-house TV programming, he was more likely to be watching Kevin Hart on Netflix, or playing one of many “M” rated XBox games while listening to music. And, during late night/early morning rounds by the nurses, he was also likely to be awake to talk with them. Regardless of his pain level, or reason for his hospital stays, he always thanked the doctors and nurses. Zachary’s valiant fight against this beast was followed by over eighteen thousand on his Facebook page. Prayers and words of support came from around the world. Zach battled childhood cancer with all he had. His courage amazed several professional football players, and a Hall of Fame professional baseball player, who he was fortunate to meet. His strength was an inspiration to those who knew him, and thousands who only saw him through pictures. His spirit remained incredible. 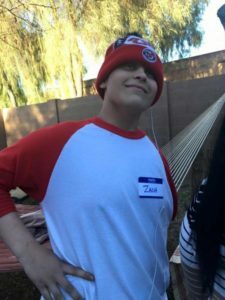 Sadly, on June 4th, 2016, Zach’s battle against childhood cancer ended. He was just 19 years old. Zachary wasn’t afraid to face death, but he didn’t want to leave his family. He didn’t want them to suffer. At the beginning of his journey, Zach wanted to help spread the word about childhood cancer, to raise awareness. As he said, “It’s not just the patients who go through this. The families go through it too”. His goal was for no other kids to go through his battle. He wanted to raise awareness. He valued getting an education. This site was set up to honor him, and to try to help achieve his dreams.